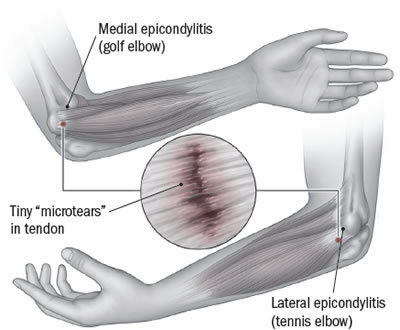 Tennis elbow (lateral epicondylitis) is inflammation of the fibrous tissue (tendon) that connects muscle to bone in the elbow. It is a form of tendonitis. In tennis elbow, the tendons on the outside of the elbow (the lateral epicondyle) are affected. In golfer's elbow (medial epicondylitis), another form of tendonitis, the tendons on the inside of the elbow are affected. The inflamed tendons may be strained or have tiny tears caused by overusing the muscles that control the wrist and fingers. Tennis elbow often results from playing tennis and other racquet sports, particularly if the participant is using improper form. However, it is caused more commonly by noncompetitive activities, such as pulling weeds, carrying a suitcase or using a screwdriver, that strain the tendons in the elbow. Sometimes, tennis elbow develops for no apparent reason.